So here we sit, in front of a slot machine game, 'meowing' at the screen, we must be playing the massively popular Miss Kitty! It is incredible how popular the Miss Kitty slot game has become over the years, it just seems to hit all the right buttons. The real money slot Miss Kitty game has been in every casino I have been in over the past few years. Mostly, you see Miss Kitty in the 4-in-1 slots, called 'Wonder Four' (I love these games, but wow, they can eat your money pretty quick) that are so popular. 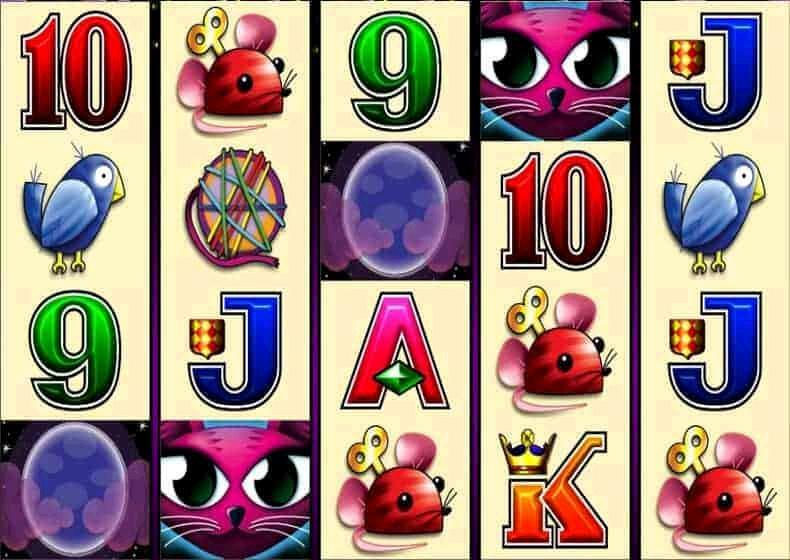 I have also seen Miss Kitty slots on it's own in most casinos, although the stand-alone version is not usually given the best positions in the casinos and is quite often hidden away in a corner of the room. That said, I have been noticing more and more bright, brand new shiny cabinets appearing recently, so the game must be getting really big again. You can play to win cash at all the land-based casinos in the USA and Canada, but if you want to ry and win money playing online, then you might be disappointed - the game is not available for real money in those countries yet. Hopefully soon. Give me a game with Sticky Wilds and I am a happy Chappy indeed. Despite allt he cute features on Miss Kitty, that make the game such a joy, all the amazing sounds, animations, the smooth game play, the way it feels, I so love the sticky wilds and I keep coming back to the game again and again just to experience them one more time. The sticky wilds, if you didn't know already, are a feature in the bonus game. During the bonus, you get free spins and if during one of those spins, you hit a wild symbol (the kitty), it sticks in that place for the rest of the bonus round. So, if you hit four or 5 wild symbols on your first spin, you are set for an amazing bonus round and sometimes you can get it so good that every single spin gives you a win. Not only a win, but a really big win, if you get enough sticky wilds. I once saw someone playing and they filled up the entire screen with wild. That was. Wild!